Ok, well I'm just gonna copy the plot and our characters we have so far. Plot: All the fictional worlds have just collided together with the Human Real world! How did this happen? Nobody knows for sure, but now the anime, video game, movie, TV, and book characters that were seperated are desperate to get back to their own worlds. Some of us are willing to help them, others don't know what to do, and some... Some are wanting to destroy them. What will happen to all the make-believe characters in existence? Age: Unknown -- appears to be in her mid to late 20's. Personality: Bold and fierce, Amelia isn't afraid of a challenge, even if the odds are against her. She has a sharp tongue, and enjoys getting on anyone's nerves, having a knack for teasing and a huge stubborn streak. She makes a fearless captain. Additional: Owns the RLS Legacy, ran into a nasty business with the Protyon Armada, and became seperated from her world in combat. Another airship had collided into her and her crew, which sent her flying overboard and into the real world dimension. Personality: Although he's dense and slow, he has a warm heart and cares for others immensely. He accepts life as it is and doesn't bother getting into anything controversial or complicated. Heck, he doesn't really get into that much in the first place. He also has an enigmatic nature that seems to grab a lot of curiosity. He usually keeps to himself but he also has a compulsive side that lends itself to his natural creativity. Additional: Was about to escape Plastic Beach after being there for 2 years in captivity when he ended up in the real world. "On Earth, in the middle of the South Pacific Ocean. It's in the middle of bloody nowhere," 2D said not really wanting to talk about it. He hated just thinking about it; it's one of the darker places of his memory even though it was the only thing he knew now. He had no idea what she was talking about with space ports and planets, but he wasn't sure if he was hallucinating at this point. It sure felt like it. Maybe he passed out and was still on Plastic Beach? That was the only thing that was making sense right now. The woman paused in her step and glanced at him over her shoulder, her nebula green cat eyes examining him from head to toe. He really did look helpless in this current situation. It looked as if he were used to being in a submissive state for most of his life, hence why he was still following her. Her expression seemed to linger on one stuck somewhere between annoyance... yet sympathy. Finally, she looked away from the man and gave an inward sigh. Once again, she was about to say something she was going to regret, "Look, if you're going to tag along, I suggest you learn how to defend yourself a bit better. I don't have time to babysit you. You'll also have to keep up; I don't plan on waiting on you all day." She replied before casting him one more glare, "And don't you EVER call me a 'bad kitty' again." With that, the felidae-sapien turned swiftly on her heel and began her forward march once again. 2-D stopped in his tracks. He didn't know where he was, and he didn't want to be alone in the middle of nowhere, but everything she described was opposite of how he was. Murdoc had told him countless times that he had to babysit him all of the time. He attempted thinking about it momentarily, which led to his jaw to hang slightly open. When nothing had really come through he grabbed his left arm behind his back subconciously, debating whether or not to continue. He glanced at the cat, realising he never learned her name; or that he could remember at least. Eventually he began to slowly walk after her again, not letting go of his left arm as he did. He then asked, "What's your name?" Her ears swiveled around to the sides, trying to pick up and signals of life, but also listening to the man following behind her. Oh, that's right. She hadn't given him her name, despite the fact that she had demanded to know his immediately. For a moment, it appeared as if she wasn't going to answer before she eventually spoke smoothly, in a rather softer tone than before. "Amelia. Captain Amelia." She emphasized. "By the way, what kind of a name is 2-D? Rather odd if you ask me, not that I'm one to judge." She added casually. When 2-D heard Amelia emphasize she was a captain he saluted in a joking manner, not that she probably saw seeing as he was walking behind her now. When he caught back up to her he decided to explain his name a bit. He sighed before starting up, "Well 2-D's not my real name, it just stands for Two Dents. Murdoc named me that after he hit me with a car," he said and paused trying not to think too much about it before adding, "twice." It had been such a long time ago that it happened, he couldn't remember if he even knew what his actual eye colour was before they got filled up with blood. Blue maybe? Yea, that was it cause he remembered it matched his hair. He frowned once again at the thought of Murdoc and muttered, "I hate that sod." Which he definately had good reason to; the man had hit him with a car twice, got two of his teeth knocked out, caused him to be catatonic, kidnapped him a couple times (which included being locked in a room for two years), and in general just beat him up and used him as a punching bag. She blinked and glanced at him momentarily as he walked beside her. "Two Dents? What the devil would you want to go by such a name for? It makes you sound not only unattractive, but stupid as well." Her eyes narrowed slightly. "Murdoc? Who's he? And he hit you with a what?" She didn't even have to know him to know that she didn't like him. If there was anything that grated on her nerves more than pure idiocy, it was people who bullied and picked on others for the fun of it or for their own personal gain. She'd grown up a bit around that sort of behavior, and it disgusted her, especially when an adult man had to endure it. He should've been out, charting his own map, not taking hits from a pathetic scoundrel who beat up on others because he most likely felt sorry for himself. "Well then, may I ask you what your real name is?" She said softly. 2-D tried thinking about it for a moment, not sure why he went with that for a name. But it was his name now. He even signed formal papers, like law suits, he'd sign his name as Two Dee. He eventually said, "Well I was named that coz of my eyes," and pointed at them before continuing, "even though they're not really dents, they're just filled with blood." When she asked about Murdoc another frown appeared on his face. He could rant on about him for hours, but cut it down just to makes sure she would get annoyed with him. He was liking the not completely negative company. "He's the bass player in our band. He actually started it up after he hit me with a car. He was sentenced to community service by helping take care of me while I was catatonic, and when I came 'round he forced me to be the singer in his band." He quieted up however when she asked about his actual name. He didn't mind giving it at all, but he just wasn't used to saying it really. "It's Stuart Pot," he said pausing before adding in, "though no one's called me Stuart in about fifteen years." "I see." She replied softly after the explanation of the bass player. "And do you like being a singer in your band?" If he had such a big problem with this Murdoc fellow, why didn't he just quit? Then again, it probably wasn't that simple. She shoved the thoughts aside and looked back down at him. This time, her expression seemed a little more gentle than it had been since she'd met him. "Well, I like the sound of Stuart much more than 2-D, if you ask me. Though I've always been one for the formalities." And with that reply came the hint of a small smile, but it was gone as soon as it came, and she lifted her gaze back to the path ahead. 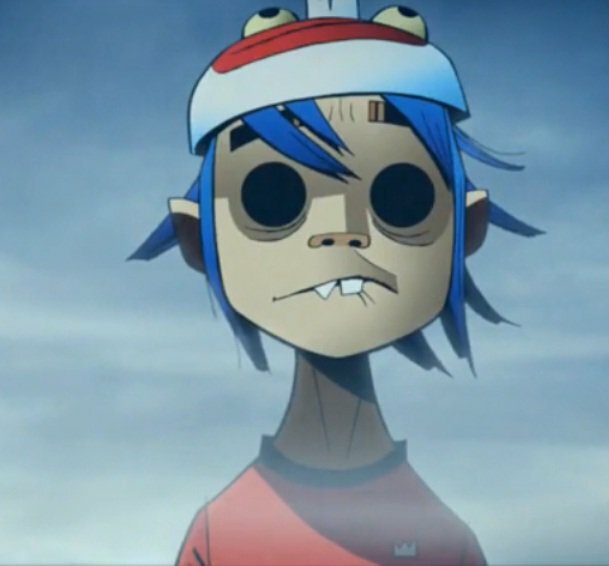 "Well I did," 2-D began off, "then after the second album I decided I didn't want to be around Murdoc anymore. He wasn't fond of that idea. He found me in Beruit and had me gassed and kidnapped me. I've been trapped in a room on Plastic Beach ever since...well up until now." He paused once more and added, "So I guess that's why I never quit, I've never really been allowed to." He shrugged deciding not to think about it anymore. He didn't like thinking about it at all really; it only brought up dark memories. After that he let his mind wander, thinking about the last zombie film he'd watched before he had ended up here. "Nonsense." The woman murmered under her breath. "Anyone's allowed to quit. You just have to learn to stand up for yourself." She'd decided that if she ever met this Murdoc, she'd give him a piece of her mind. But that wasn't the matter at hand. Right now, they had to find a way out of this wasteland. She didn't know how long they'd been walking, but it seemed like this place never ended, or as if they never got any closer to their destination. "This would be so much easier if only we could fly." 2-D placed his hands into his pockets and continued to follow Amelia without thinking much. When she stated something about flying he replied, "I don't think people fly." He began kicking his feet in front of him, letting the dirt fly up. He was getting bored and needed something to keep his mind off of the heat. He really wished he had a keyboard or melodica or some sort of instrument to play. He didn't know what to do with himself when he couldn't be around music.